Let us start by identifying exactly what a boost pedal is to clear up any confusion that might exist. 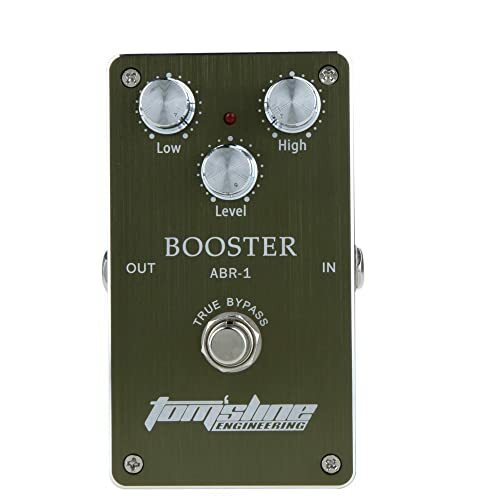 A boost is simply a pedal that increases the signal gain, the volume of the signal your instrument is producing. It is actually a very simple pedal usually with just a level control and an on/off switch. Some misunderstandings arise because of the effect produced depending on where in your effects chain the boost pedal is placed. When placed in front of all other effects pedals it is known as a ‘clean effect’. Increasing the gain of the clean sound. Whereas if it is placed after other effects the gain will apply to those effects as well. How you use it will, therefore, have an effect on the results produced. There are some very good pedals around so let’s have a look at the Best Boost pedals currently on the market. Do I Want The Sound To Change With The Gain? 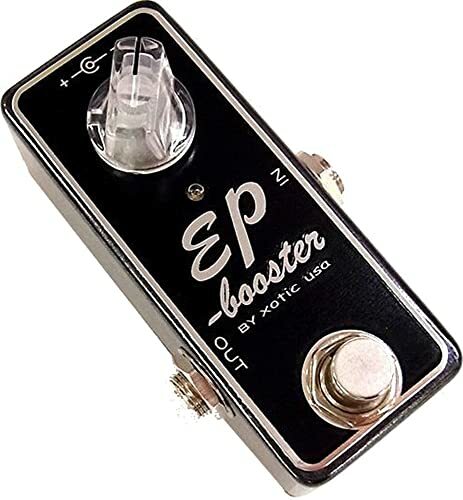 This pedal uses the already established preamp of Xotic’s EP-3 echo processor. It will offer you a maximum of 20dB of boost to the original signal which means it packs quite a punch. Onboard controls give you the option of making some adjustments to the sound of the boosted signal and your EQ settings. Some of the worlds best-known guitarists have used this original echo processor as a preamp to create their own tones and sounds. It’s therefore not a surprise that this is a popular boost pedal. It has a FET (Field effects transistor) and low impedance output. It has two DIP switches, one for boosting the bass signal the other for extra gain on the high end. These are significant controls and their use can give you some interesting sound options. When added as a clean boost the signal is bright and clear and becomes richer and thicker. From that position, adjustments to taste can be made. Please consider when making adjustments, the effect that applying 20dB of gain, to the sound you are creating at a lower volume. 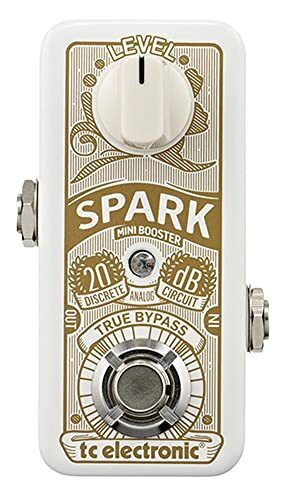 As a clean boost this pedal does not add distortion to the basic signal but placed behind effects it will increase the gain of those sounds produced by other effects pedals in the chain. As this is a powerful boost pedal that should be a consideration when you decide where in your pedal chain to place it. It is built in a small casing and has an illuminated LED. And, is powered by a 9v battery but will take an AC adaptor. A very powerful and efficient pedal that is moderately priced that will allow you to crank up the volume when you need it. Great preamp processor gives you 20dB of gain. Competitive price for a quality pedal. Being a small unit may make it awkward to operate. This pedal is designed to fulfill a few options. It will operate purely as a boost pedal but it gives you an overdrive option through its own controls. It could be described as a mirror image of a Klon pedal. The volume control is very active and will not take much pushing to drive the pedal hard. The gain control is a little confusing at first but when you appreciate that this control also acts like a mixer between the clean and distorted sounds, you will be able to create some interesting options. The treble control also needs a little bit of explaining in that this control operates in a similar way to an EQ and gives you a variety of options, especially at the top end. It is a well made robust pedal with a metal casing that is built for stage performance and will take its share of usage. This is an interesting product in that it has been labeled as a boost pedal but many players do not use it as such. The overdrive sound seems to be the effect that stands out, and it certainly does. Using the gain control to drive the pedal creates some great overdrive sounds. It is therefore considered by some to be more of a distortion unit. That said, it produces a good boost and when the gain is not applied and the pedal is used to create clean boost only, it also works well. It runs from a 9v battery or a power supply. If you want a boost pedal but also want a bit more then this is worth a look. Extra tonal and sound features. 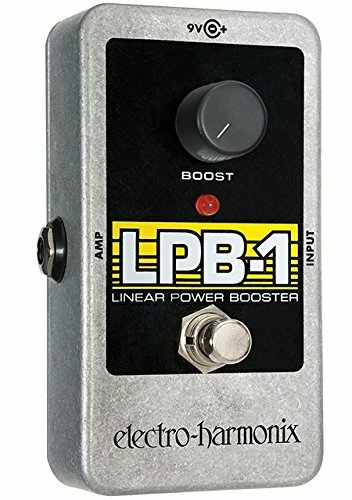 Some may wish to purchase a boost pedal without added effects. Will take a little understanding to get the best from it. If there is one thing you can expect from Zvex its quality, lots of it. Oh, and maybe a little bit of the crazy about the design. There’s nothing crazy about the performance though. This is a powerful pedal. The design is simple, just a volume control they have named ‘crackle ok’ and a basic heavy duty stomp switch. The crackle ok is a reference to the inputs on early recording consoles which would crackle. That’s it and when you consider the job the pedal is designed for, that’s enough. Simple effective design, but what about the performance? Stunning is one word you could use to describe it. The gain reaches levels other pedals aspire to, so be prepared. It operates beautifully when driven hard and creates a great overdrive sound just from volume. Used clean it gives a punchy sound that really enhances the top end. This pedal comes into the category of being termed as transparent. This means it is not as rough-edged as a pure distortion unit but with more of a clean volume increase that will push your amp to the limit. It is well made and a tough little pedal and operates off a 9v battery or an adapter. If you are looking for a boost pedal that provides a stunning increase in volume that also creates a great tone as you wing it up then this pedal is worth considering. Quality comes at a cost and this pedal is not cheap. Creates great sounds when driven hard. Another simple design and easy to use boost pedal. MXR are of course an important name in the world of effects, and here they have created a pedal that does what it was designed for and does it very well. Using this pedal couldn’t be much simpler. You set the amount of gain you want and then when you need it, hit the button and there you go. The obvious use for such a simple operation is to increase the guitar volume for solo’s or specialized parts but it can also act as a boost to your signal if you are using a large number of effects where loss of signal can be a problem. One of the good points about this pedal is that not setting the gain too high allows you to have a very clean increase in volume, but setting it a little higher and you get a nice broken sound. One aspect about this pedal we really like is that it is what you might call a no frills pedal. It doesn’t offer a string of effects, it is a boost pedal, and that is what it does pure and simple. Because it is simply a volume gain it will also work well with a bass guitar and keyboards, though you may have to make some external EQ adjustments to cope with low frequencies. Some musicians prefer their pedals simple and to the point, to do what they want them to do and not much else. If you are one of those this is a great little pedal that will serve you well. If you like a pedal to perform multiple tasks then maybe this will not be for you. It operates on a 9v battery and is well made and rugged. Sits in the middle of the price range. Some may think it is too basic. In the late 1960s Electro-Harmonix introduced us for the first time to overdrive. We sat up and took notice. This pedal carries a replica of the original circuit from that iconic early effect. The sound you get from this little pedal is big and powerful. This is another pedal that whispers in your ear, simple is good. And, easy to use and manage, it certainly is. Just one boost, gain control and an on/off button is all you get. It can’t get much simpler than that. The sounds it produces as you would expect from Electro-Harmonix pedals is crisp and clear, and when used as a clean boost it provides a sound that cuts through. A little bit further with your boost control and it will give you a little overdrive. 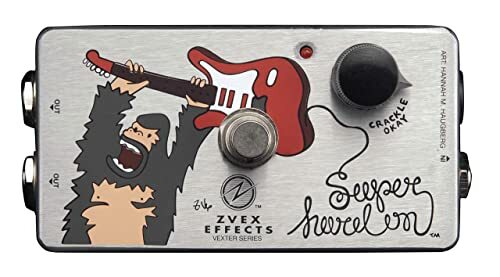 This pedal is not designed to change the tones of your guitar or amp, it is there to just increase the gain to let your instrument cut through for solo’s or other times when it needs to. Being so simple to operate with its one switch and one gain it does its job well. It provides a natural sounding gain in volume. It is a true bypass pedal. Situated in the mid price range. Well made it has a sturdy build and not too large with its metal die-cast box. It operates on a 9v battery and has a centrally mounted LED indicator. Being of such a modest size brings its own problems sometimes and the off/on button is situated very close to the gain control which means you might have to be a little careful to not alter any boost setting you may have set when turning the pedal off and on. Another great little piece of kit for those looking for a simple to operate boost pedal. Care needed in operation on stage. TC has given us a basic, but very good pedal that will generate up to 20dB of boost. It has an interesting design that makes it very attractive and somewhat different to the norm. It can be used purely as a clean boost or alternatively, you can push it a bit harder and push it into overdrive. The clean boost it provides is exceptional and the top end is really highlighted. It has a clever design in that you can use the footswitch to turn it on or, as an alternative, just depress the switch lightly and it will give you a brief boost until you remove your foot. The switching is well-designed, feels soft and is seamless. No audible ‘clicks’ that you can sometimes get with a button switch. It has a true bypass design and will not reduce the quality of your sound while in use. It is a simple one control, one switch effect that packs a punch, and is purely and simply a boost pedal. Compact in size it is well made and capable of taking the rigors of stage performances. If you are using multi effects pedals you will need to experiment a little to find the ideal place in the chain. This is because the boost on the clean sound is so good and crisp you really would not want to lose it. It is one of the big features of this pedal. Simplicity, great sound, this pedal has a lot going for it. How much? Very inexpensively priced makes this pedal fantastic value. It operates from a 9v battery. A basic pedal that might not suit someone looking for more. If you see the name Jim Dunlop or MXR then you can expect quality. They have teamed up with CAE’s Bob Bradshaw to design this pedal, so what can we expect? Made of high-quality components and with the know-how of people who know what they are doing, it is a quality boost pedal. It delivers up to 20dB of clean boost and will certainly enhance your sound. It doesn’t lose its top end when in use. Also, it does not add any presence by default, but it does give a little EQ boost to emphasize its clean sound. It is a true bypass pedal and in the off position will not color your sound. 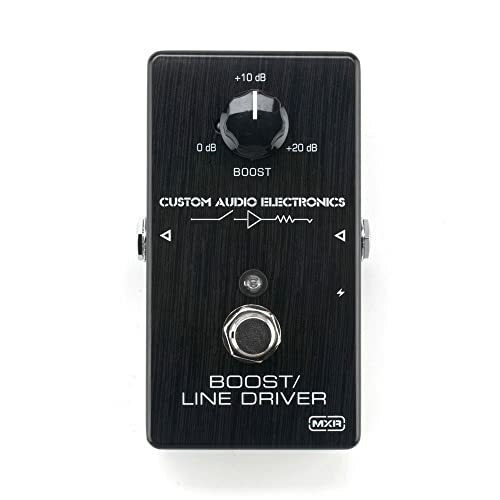 Unlike other boost pedals, it does not operate as an overdrive or distortion unit. 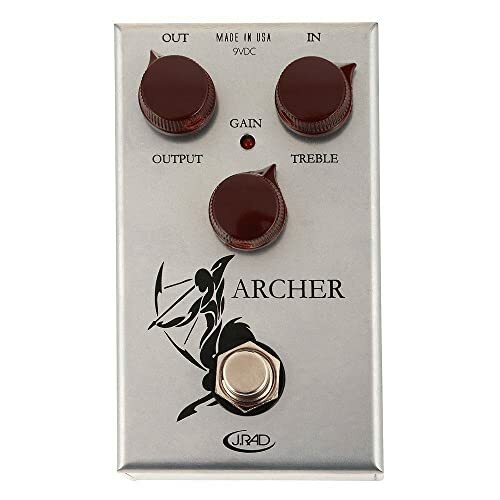 It will drive your amp and create a little of course but it is the clean sounds which make this pedal outstanding. Unlike some boost pedals, the MC 401 will work very well with bass guitar or other bass instruments. You can click in and out to allow solo’s or just to give a little extra to a certain passage. The construction is solid and rugged and with just one switch and one control, it is easy to manage and use. It has an LED indicator light. It’s not a precocious pedal and creates no extra effects but what it does give you is great clean boost. Pricewise it sits towards the top end, but it is a quality pedal. If you are looking for a simple boost pedal, then this is worth a look. It operates from a 9v battery. Superb clean boost up to 20dB. There have been issues about reliability but these seem to have been resolved. 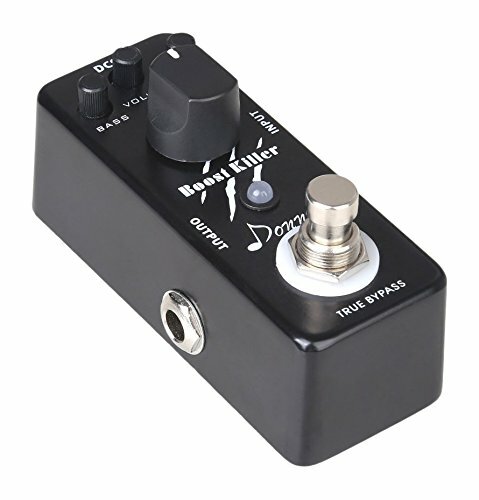 Donner has produced a boost pedal that will give up to 15dB of gain. It does emphasize its distortion capabilities which give it a certain purpose and feel. Operating as more than just a boost pedal, it might almost be described as a multi-effects pedal. It will give you a clean boost, and by adjusting the volume and gain controls this can be achieved. Once you have worked out how to do that it won’t be difficult to preset any sound you want. There is an onboard EQ that will change the levels for bass and treble. Therefore if you want a different sound once the boost is applied this is possible. The larger control knob will give you overdrive, though it is not particularly powerful. It does, however, create a rough-edged sound when combined with other effects. As a boost pedal it works quite well. It can produce a clean sound without losing anything from the tones. It will make your amp sound a bit warmer and richer without extending the volume too much. Some people will appreciate that you can apply other effects and that it has a more fixed distortion sound and EQ. Price wise, it is very cheap and really you can’t go too far wrong. No, it won’t produce the shimmering sounds of pedals five times the price, but then you wouldn’t expect it too. It is a premium, low-cost pedal, and does its job relative to its cost. It has true bypass. The build on the pedal is sturdy but rather upright, and we can envisage stability problems. Low-cost pedal with extra effect possibilities. May have stability problems due to its design. Another budget, premium pedal, this time the Aroma ABR-1. It is a boost pedal but again with some extras, in this case, some delay. It has a true bypass design to prevent any loss of tone. Three controls operate the functions and it has a built in operation amplifier. An LED display is visible and it operates on a 9v battery. It has a bright sound when used clean, but power is at a little bit of a shortage. It might be considered a beginners pedal, an introduction to a boost control and what it can do. The amount of boost is also lower than most other pedals, at up to 10dB. Playing at home, it will work well, possibly even enhance the sound of your guitar but we are not sure how that would transfer to a large hall. For the price though it does offer the basics. It can’t compete with its more illustrious competitors but then it doesn’t try to. It’s a basic, low-cost pedal that will give you what it says it will. It is solidly built with its aluminum body and the controls are simple and effective. 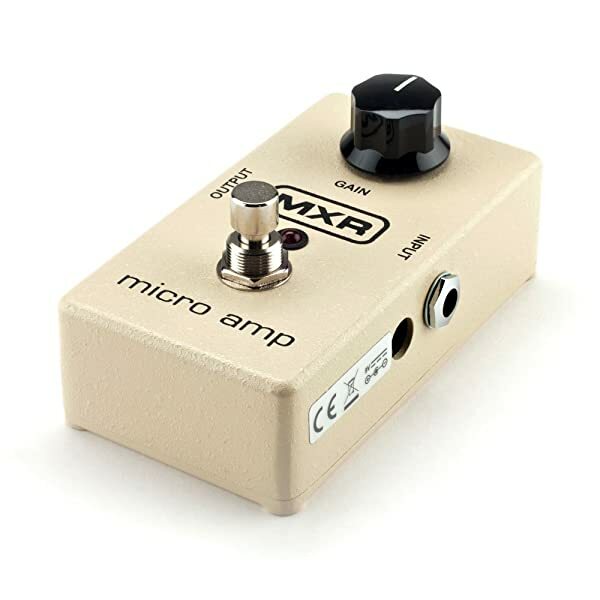 One of the problems with a pedal like this and others of its kind is that they are a bit underpowered and therefore to get a sound from them they have to be driven hard. This can produce irritating ‘white noise’ which is not good. At the end of the day, you get what you pay for. Its low cost, it works well at its level and it can do a job for you. It has an LED status and operates on a 9v battery. If you’re looking at the premium end, it’s worth a look. 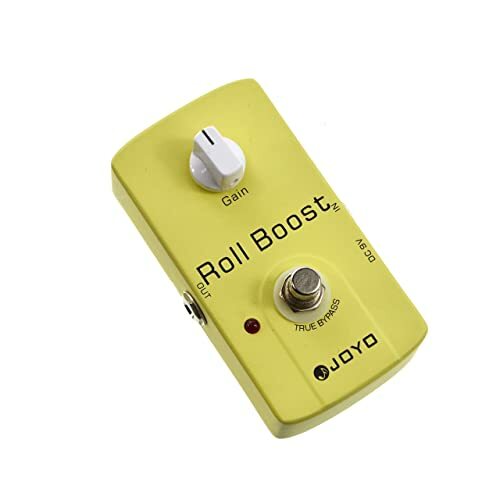 The Joyo Audio Roll boost is a pedal designed to just provide a boost for a solo instrument. From that perspective, it provides a very good clean increase in gain to your guitar. 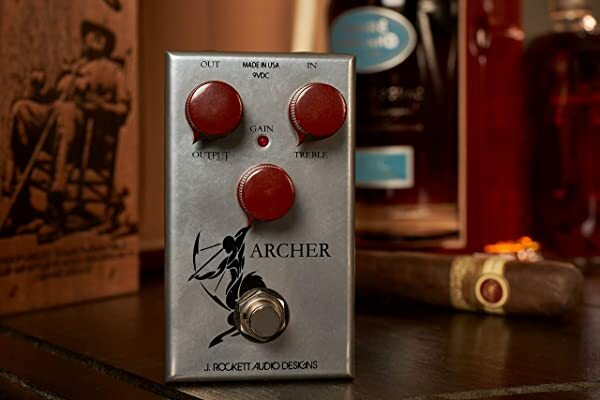 It is a well made little pedal with an interesting color scheme. The actual boost of the pedal is described on the unit as gain. It gives no indication of just what you might expect from the unit. It should do and maybe a warning, as this pedal will knock out up to plus 35dB. That should wake up the neighbors. In providing such an increase, a change in the tone cannot really be avoided, and it is at the top end you will hear it most. It has true bypass and is built to be easy and simple to operate. This is another premium budget pedal that is great value for money. Made in China, its sound is powerful, and as a clean boost, it works very well. As with all budget pedals of any description, they cannot compete with those vastly more expensive. This little pedal does though have a go, and certainly, with its plus 35dB capability, it will at least make people sit up and listen. While it is well made we are not sure exactly how much punishment it might take on the road. Physically it does not look the strongest of pedals, and when you stomp around on them, they do need to be able to take the strain. However, it makes a good sound, has an enormous gain increase if needed and is right at the bottom end cost wise. Certainly is a pedal worth looking at. Very bright at the top end when boosted clean. Color scheme may put some people off. We have been able to review some great products with these pedals. And, some made by manufacturers who are not so well known. Every pedal we reviewed had some very good reasons to buy it, but as always it is what you want to use a boost pedal for. A boost pedal does exactly what it says it does. It boosts the signal from your instrument to raise it above the level of other instruments. No secrets there. Remember though, that boost pedals were created just to increase the volume and not add other effects like distortion. It is often referred to as an extra volume control for your instrument. It may be a simple principle and its uses obvious, but to get the best out of a boost pedal you will need to decide when you will use it and what you want from it. With the application of an increased volume, there could be an affect on the overall sound of your instrument, especially with a guitar. Overdrive will be added almost as a matter of course, but some pedals offer other options. It is possible to project a clean sound, to just increase the volume without too much distortion or other effects added. Some may prefer this option. Similarly, some may want that solo to really scream at you, and some of the pedals we looked at will give you that option. It is important to know what you want the pedal to do and also to consider whether you already possess other effects that will give you the added sounds. If you have, then maybe you just need that increase in volume that even the most basic of pedals will give you. After you have bought your pedal, you may need a little time to work out how best to use it. If you have a number of other effects pedals on your board, where in the pedal chain will you place it to get the best from it. Where it is situated on your board will have a marked effect on how it works and on the performance of the other effects. All of the pedals we reviewed offer something. It’s really a matter of deciding how you will use it, There is a significant difference in price for some of the products, and we have tried to include a couple of premium options. Not everyone uses a boost pedal but when used in a certain way it is a huge asset to you as a musician. We hope we may have given you some food for thought as you consider the options. People that know us, know that with pedals and effects we go for simplicity, ease of use but with real quality. Finding the best boost pedal is no different. Real quality from a brilliant manufacturer, it does everything we would need it to do and does it easily and very well. Price wise it sits in about the middle and represents fantastic value for a great boost pedal.